360Geographics now offers four maps under the imprint 360Maps: Annadel State Park, Sugarloaf Ridge State Park & Hood Mtn Regional Park, Jack London State Historic Park & Sonoma Valley Regional Park, and China Camp State Park & San Pedro Mountain. The 360Maps Pocket Series maps are designed to be easy to use and carry with you. They are printed on tear-resistant and water-resistant synthetic paper and fold down to a perfect pocket size. Once you open it up you'll see that we've gone to a great bit of trouble to make this map useful and easy to read. Contour lines will help you determine if that hike or ride looks good or should be saved for a cooler day. Shaded relief will allow you to get an immediate feel for the lay of the land. And we show plenty of roads outside the park so you can figure out your own best way to get to where you want to be. We've hiked or biked every trail in the parks, used GPS to make sure our trails are accurate, and used a wheel odometer to determine distances between trail junctions. 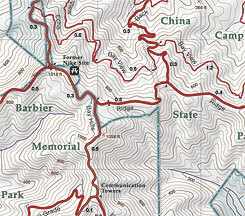 Other things we add to our maps are helpful reference points and a GPS grid. Annadel is located in Sonoma County, California just east of Santa Rosa and is a very popular park for hikers, mountain bikers, and equestrians. It has over 37 miles of trails, most of which are open to bikers and horses as well as hikers, and encompasses almost 5,000 acres. The elevation varies from 320 feet at the Cobblestone Trailhead to almost 1,887 feet at Bennett Peak (with the highest trail being Ridge at just over 1,400 feet). 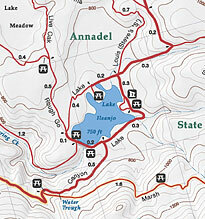 The 360Maps: Annadel State Park map is 3.4" x 5.5" when folded and 11" x 17" unfolded. The scale is 1:24,000 (the same as USGS 7.5' Topo maps), with 40 foot contours and an index contour every 200 feet. The map can be found at a number of bike stores, outfitters, bookstores, feed stores, and saddlery shops in the Santa Rosa area and can also be purchased on this website (see below). Sugarloaf is located on the east side of Sonoma County's Valley of the Moon. While just 20 minutes or so east of Santa Rosa, a day up on these trails can really make you feel like you've gotten away from it all. The state park and connected Sonoma County regional park have trails up to two of the highest peaks in Sonoma County: Mt. Hood (in Hood Mountain Regional Park) is 2,730 feet and Bald Mountain (in Sugarloaf Ridge State Park) is only a foot shorter at 2,729 ft. Bald Mountain offers sweeping views and on a clear day at the summit one can see the Sierra-Nevada to the east, the Bay Area and even the Golden Gate Bridge to the south, and the Pacific to the west. Camping is very popular at Sugarloaf, as well as horseback riding, and visiting the Robert Ferguson Observatory for solar viewing and stargazing on summer weekends. If remote areas are what you seek, the trails in the McCormick Addition to Sugarloaf are perfect. You can find your own peace as you follow a trail to the Grandmother Oak or just take a lunch and picnic by the headwaters of Santa Rosa creek. The two parks have over 36 miles of trails, most of which are open to horses as well as hikers and many of the more remote ones are open to bikers. The elevation varies from 640 feet at the Goodspeed Trailhead to 2,730 feet at Mt. Hood. 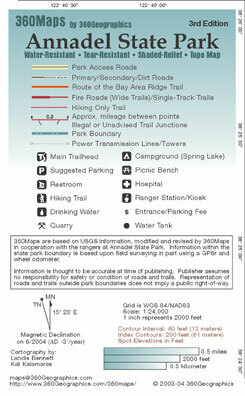 The 360Maps: Sugarloaf Ridge State Park & Hood Mtn Regional Park map is 3.4" x 5.5" when folded and 11" x 17" unfolded. 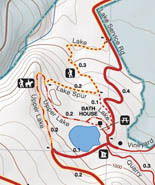 This map is double-sided with a scale of 1:12,000 in the Adobe Canyon area of Sugarloaf (including Bald Mountain) on the front and a scale of 1:24,000 (the same as USGS 7.5' Topo maps) covering all of both parks on the back. Of course we have topographic information with 40 foot contours and an index contour every 200 feet on both sides. The map may be found at a number of bike stores, outfitters, bookstores, feed stores, and saddlery shops in the Santa Rosa area and can also be purchased on this website (see below). In the heart of the Valley of the Moon, adventurer and author Jack London made his home at a ranch in Glen Ellen. At his ranch he dreamed big including the ill-fated Wolf House as well as his model ranch he called the Beauty Ranch. He entertained at his lake or went for hikes through canyons and forests, around springs and streams. Today the park has almost 20 miles of trails most of which are open to horses and bicyclists as well as hikers. A portion of the Bay Area Ridge Trail takes you from the parking area at about 650 feet to a trail running along the eastern side of the ridge of Sonoma Mountain at about 2,060 feet. The highest point in the park is just shy of the summit of Sonoma Mountain which is 2,463 feet and offers views of the Sonoma Valley sweeping across San Pablo Bay to Mt. Diablo. The 360Maps: Jack London State Historic Park & Sonoma Valley Regional Park map is 3.4" x 5.5" when folded and 11" x 17" unfolded. This map is double-sided at a scale of 1:12,000 with all of Jack London on the front of the map and Sonoma Valley Regional Park, including the publicly accessible trails of the Sonoma Developmental Center, on the back. Of course we have topographic information with 40 foot contours and an index contour every 200 feet on both sides. The map may be found at a number of bike stores, outfitters, bookstores, feed stores, and saddlery shops in the Santa Rosa area and can also be purchased on this website (see below). China Camp State Park is located in Marin County, California in San Rafael and is a very popular park for hikers and mountain bikers. It is one of the last great places in Marin County that has single-track trails open to mountain bikers. China Camp State Park is on the east side of San Pedro Mountain. San Pedro Mountain is separated into 3 different parks that protect this great open space. San Pedro Mountain Open Space Preserve is run by the Marin County Open Space District and is located on the north-western portion of the mountain near the Santa Venetia neighborhood and the Marin County Civic Center. Harry A Barbier Memorial Park is run by the city of San Rafael and is often referred to as "the back-side of China Camp." People often access it from behind the Dominican College, or from China Camp State Park. The 360Maps: China Camp State Park & San Pedro Mountain map is 3.4" x 5.5" when folded and 11" x 17" unfolded. The scale is 1:20,000 (a slightly larger scale than USGS 7.5' Topo maps), with 40 foot contours and an index contour every 200 feet. This map can be found in Marin and Sonoma County at bike stores, outfitters, and bookstores. If you'd like to order one directly from us, you may now do so with a credit card or directly from your checking account through PayPal. We will ship the maps via USPS within 1-2 days of your order, but in case we're out working on another map, please allow up to 10 days for your order to arrive. If you need to return a map, please contact us via email for a return authorization. Returned products must be in resellable condition. If you would prefer to pay by check or money order, please download our Retail Order Form (76k PDF). If you are interested in reselling these maps, download our Resale Order Form (88k PDF), and send it to us.